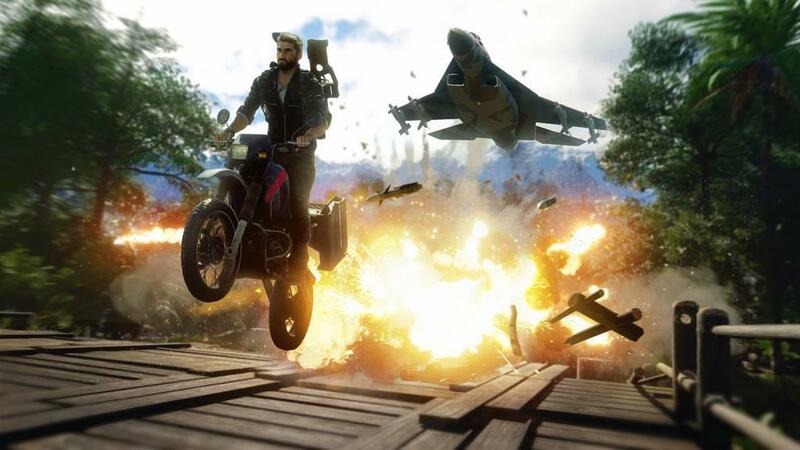 Just Cause 4 kicks off its very first mission with a tired video game trope: your protagonist, Rico Rodriguez, waltzes right onto the scene of what will become the final mission with a fully developed loadout. But of course instead of triumphing in that first attempt and driving the total playtime down to about 12-20 minutes, you fall flat on your face, are stripped of all your gear, and have to start this chapter of a developed franchise stripped back down to the basics and work your way back to a full load out. You awake from that first encounter face down in a puddle and have to hoof it on foot to the first objective. Except that whole bring the character and his ego down to earth story arc only plays out for about 5 minutes. 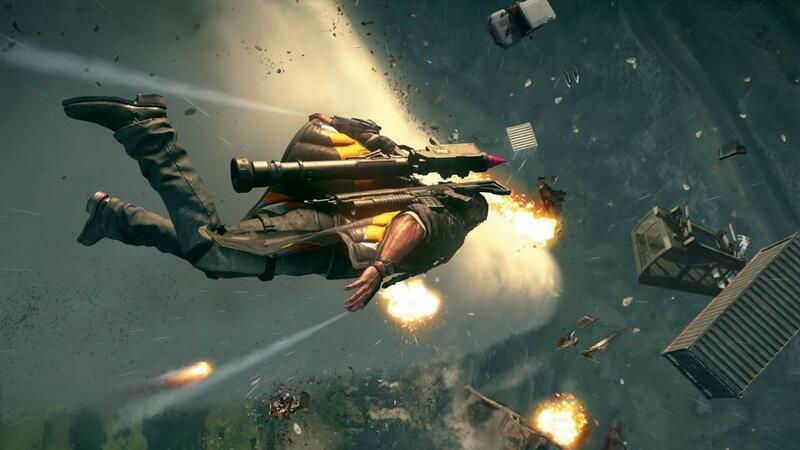 Your walk of shame lasts until Rico finds an old toolbox and presto, grappling hook, wingsuit, parachute, all the gear is restored and the revolution is in full swing with Rico on the point of the spear. 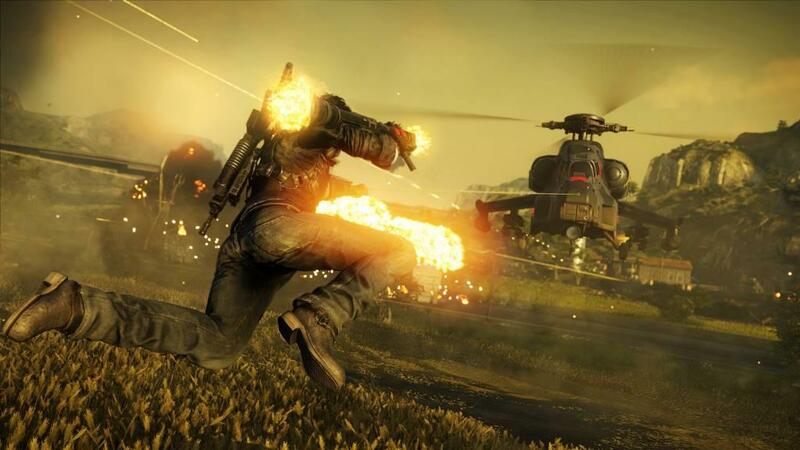 This isn't a tired trope reboot, this is a Just Cause game and the only reason to get knocked down for those five minutes is to take one close up look at the scenery and realize there is no sprint button before discovering you'll never need to sprint again when you have a gaping hook stuck to your arm that can attach to just about anything and sign you through the game world at will. For that second there though, you are led to believe this game is going to be something more than just a sandbox to create mayhem. Blink and you'll miss it. A few minutes and a second mission later, a screwdriver is all it takes to start upgrading and repurposing the gear from the last Just Cause into this new iteration. This is not a game that is going to make you plod through a long and involved redemption story arc to get to the goods. It is going to put those goods on offer from the start. 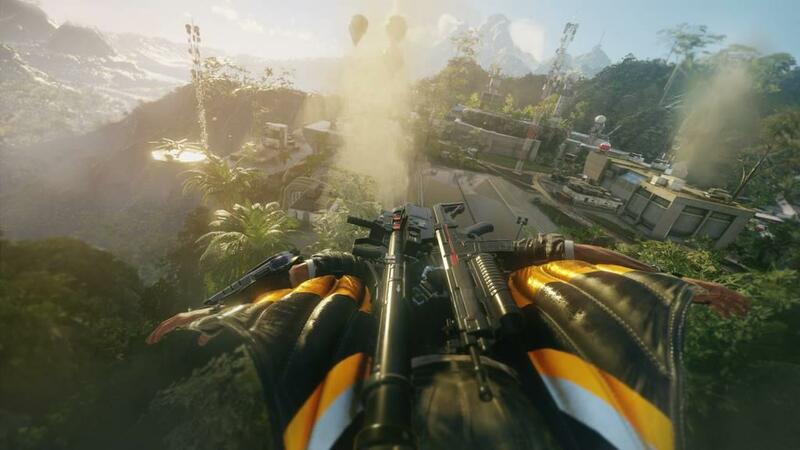 Because while this game does feature some distinct differences from Just Cause 3, at its core it is simply following that formula of giving the player an arsenal to paint with and a massive island nation canvas to paint on. It merely suggests that the plot will be there to give you a reason to move along every once and a while, but the crux of this game is simply to put together a tableau of hi-jinx and chaos. 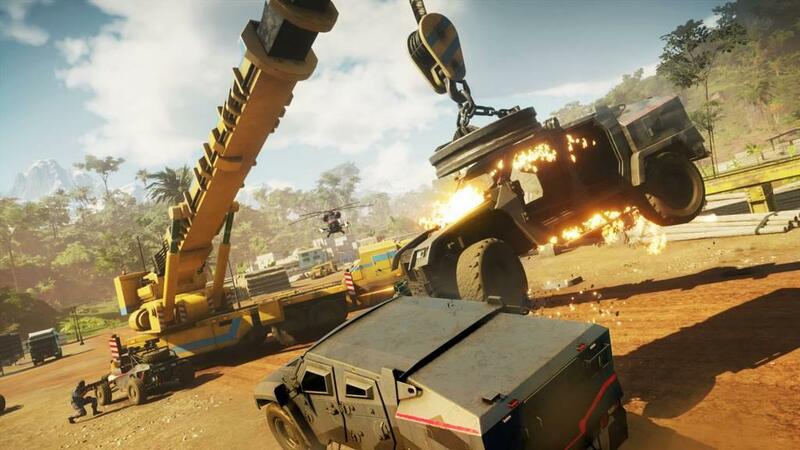 Most of the gadgets, vehicles, and weapons, and even gameplay elements are carried over with minimal change, but those minor changes are significant. Gone are the long loading times that really plagued JC3. This island loads in near seamlessly. Gone are the stingy economics behind requesting supply drops. 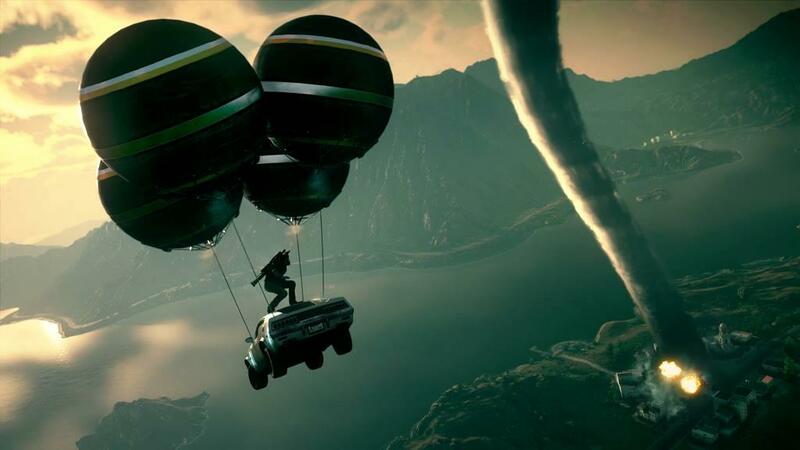 Drops are meted out on a timed basis, use a pilot to drop in a vehicle our weapon of choice and you will have to wait a few minutes for them to "resupply" and be available for the next drop, but the drops themselves are free of charge and can be spammed as soon as that timer ticks to zero. These are significant quality of life improvements, putting more of the gear you want at your fingertips and expediting the whole process of moving through a rich world. There are other changes that work a little less well. While the entirety of the map is open from the go, to actually progress you have to march your revolutionary army forward, claiming territory a zone at a time and managing troop counts to be able to advance and keep pressure on the ever-expanding front. So on the one hand the game immediately offers the full gadget experience and land on which to experience it, on the other hand it metes out the plot progression behind this strategy of attrition, which gets a bit clunky at times. Also, while the game loads beautifully and soaring up to take in the birds eye view of the various locations is breathtaking, swooping in close starts showing the warts pretty clearly. Or should I say blurr-ily? Because so many of the textures in this game are shoddily done. In the opening cutscene Rico's beard was just a blurred mess with no definition in the whiskers what so ever. There are plenty of jarring pop in issues with artifacts appearing out of nowhere as your character moved closer to the locations. Some of this lack of finish also percolates through the the gameplay. The NPC AI is about as dumb as you'll find in a modern game. Enemies are mostly useless, they will occasionally take up a good position behind cover but mostly just run out a few steps, take a couple of warning shots, run to another exposed position, stop and have a good think about maybe engaging for a while, maybe look the wrong direction for a bit more, then finally start another volley of bullets. In some ways this lack of threat is a blessing because it is served alongside a lack of reliable knowing where the attacks are coming from. There is no on-screen radar to illuminate threats (despite Rico having a freaking robot eye), no highlighting of opposition forces either by discernible hit indicators or reliable tracer shots. You know you're getting ripped into, but without a few 360 degree spins to try and spot a muzzle flash it is really pretty hard to make sense of where the ripping is coming from. But when the rips come only infrequently and without all that much bite and even less strategy, it makes for the some fairly easy encounters, but also bleeds in to your own allies. This doffuses will fail to lock on to critical targets, make terrible pathing decisions when ferrying groups from point A to B, and do other generally infuriating things. Infuriating because so many missions are designed around interacting with these allies, leading them to safety or guiding them through taking down a target and they are mostly useless. The game still works because these distractions are minor and irksome, not really game-breaking, and because the major appeal is a seamless world, open from the go. 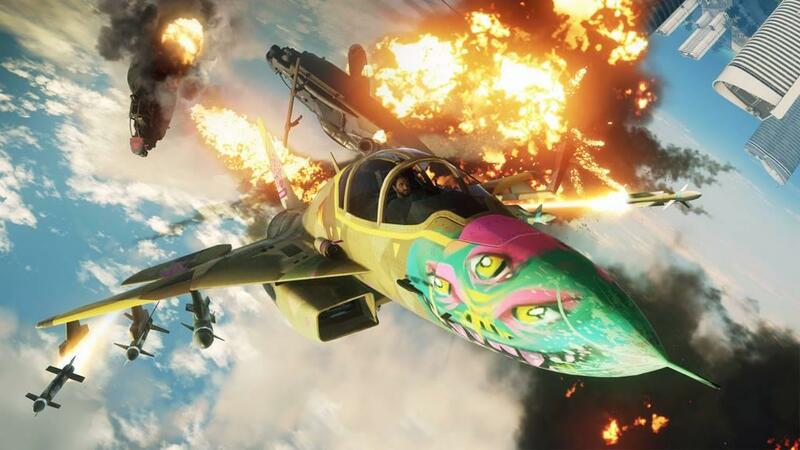 That world is a playground to fulfill the core gameplay loop of driving things fast, making other things go boom, and slinging around the world from grappling hook to parachute to wingsuit back to the hook when momentum starts to run a little low. This game is what would happen if Spider-Man and Xander Cage had a lovechild and had to fight Storm from the X-men. 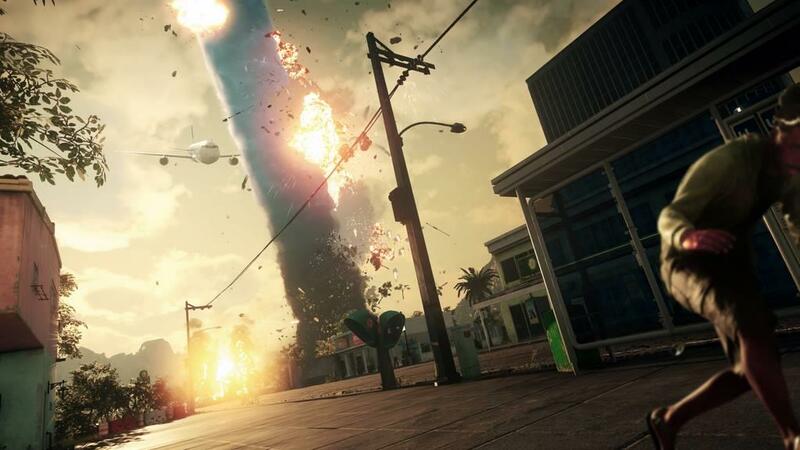 Just Cause has always been a bit camp but to dial this one up to 11 the big foe is now not some man or some tank, but a doggone Tornado, Sandstorm, and Lighting Storm. You're no longer just taking on some Banana Republic with a private army, this time we've got to lasso Mother Nature herself. And why not? This game was always about being a bit over the top, crossing over into the silly and ridiculousness, and from the goofy side plots that lead to your grapple upgrades to the main plots that introduce you to ride the whirlwind, isn't this all the logical next step? So that's what it does, but how does it play? Control scheme wise, that grapple is just too busy also way to flighty trying to lock on to the right thing. It's pretty obvious I always want to grapple the top of the ledge or onto the vehicle; not some indiscriminate point on the side of the wall, not under the catwalk, and not the asphalt just next to the car. I want to vault on to things, over them, and into a new ride, that's a no-brainer. Yet there is no discernible aim assist to help me with these high flying navigations. The grappling hook always seems to think I would prefer to latch just. bit to the side of the primmer target with the real payoff. It allows for precise controls but is simply a bad design. Otherwise everything in the game maps well. You have two weapons to swap between, each has a primary and alt fire that might unleash a barrage of ammo, lock on for an easy kill, launch a drone, or even plant down a shield. It's easy and intuitive to swap around these weapons, to quickstep between grappling hook load outs, anything else that needs to be done. The only thing that doesn't map well is, well, the map... Rico is obviously meant to spend his time grapple swingin' for fun and profit because spend any time running on foot anywhere that isn't paved over and you'll find that despite Rico's ability to leap from plane to plane and pull of Evel Knievel style stunts with deference, the boy struggles to run over small rocks or jog around low hanging obstacles. Our guy can can plane-jack aircraft in flight but can't step over a root. Overall though, the warts mostly get a pass. So the textures and pop-in kinda stinks, but this game is meant to be played fast to the pain that your attention should be drawn to the cliff edge or telephone pole you are blazing past with inches of clearance not the distance background object making it's abrupt entrance to the race. Move fast and you won't have time to notices those discrepancies. move fast sand the blurry textures become a feature. 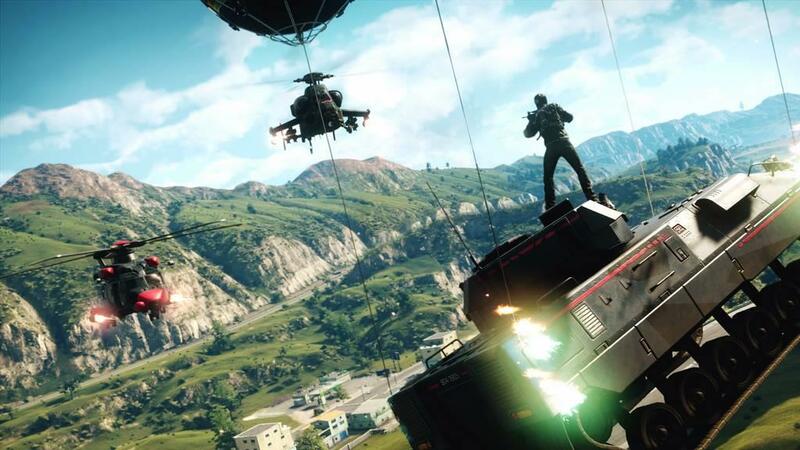 I will gladly take some technical limitations to eliminate the load hell of Just Cause 3 and provide that seamless world. And it is a truly open world. 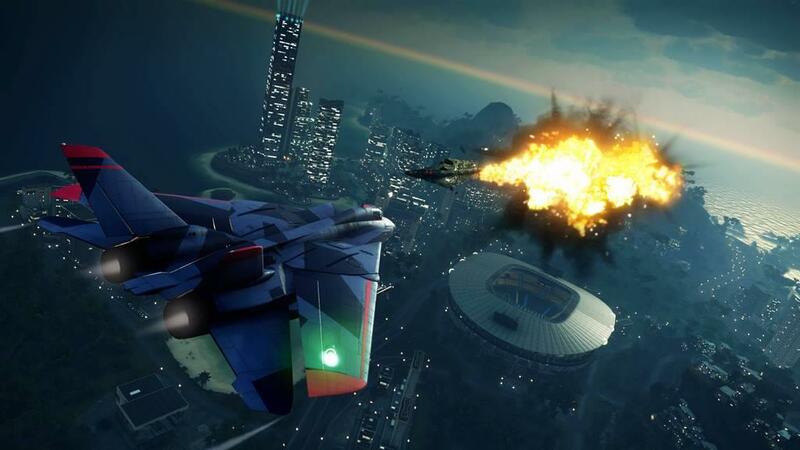 The final mission has to come last but players can tackle the rest in any order they choose. It is also very fluid in tracking both main missions and side quests and gives you lots of resources to identify what is on deck, what has been done, and how much progress has been made. At the end of the day what do we have? A game that is far from perfect, but that knows what it wants to be. A bit silly, a lot fun. 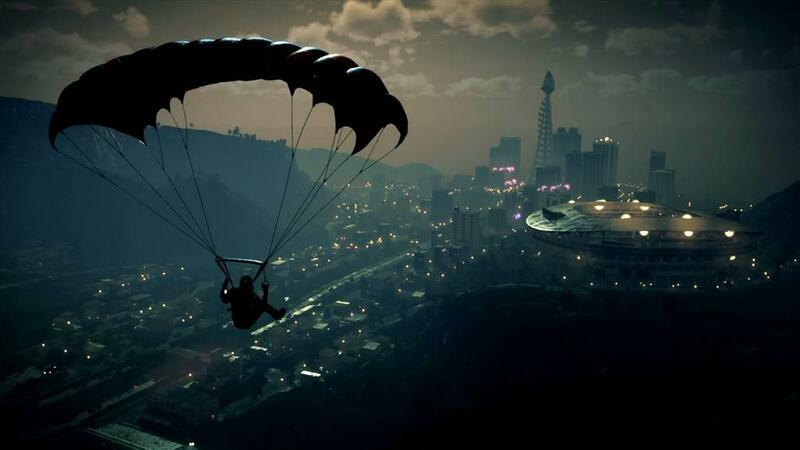 An open world without artificial boundaries. You can play this game how you choose, but going balls to the wall is clearly the most enjoyable option, and there are no hinderances to that choice. 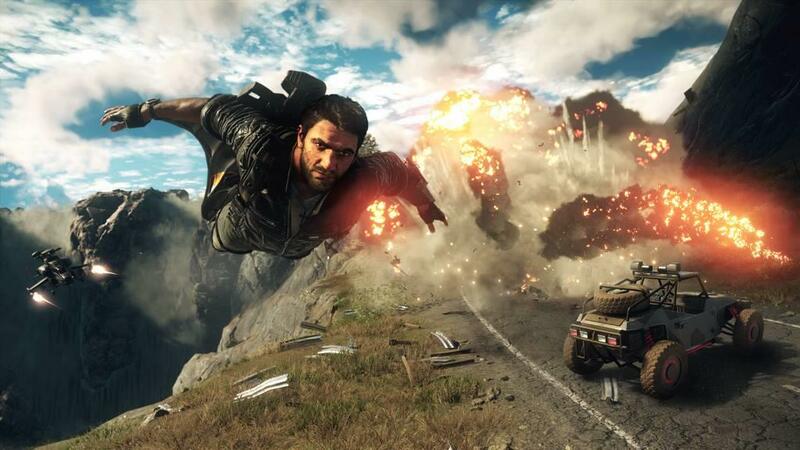 Taking more of a narrative approach while not really offering all that much narrative but definitely adding a little more marvel in the form of cataclysmic weather events as the major antagonist, Just Cause 4 is a shade more than just another Just Cause game. The major gameplay loop of orchestrating chaos remains true to the series but it is meted out just a bit more slowly while unlocking the goodies to perform your opus just a bit more freely. 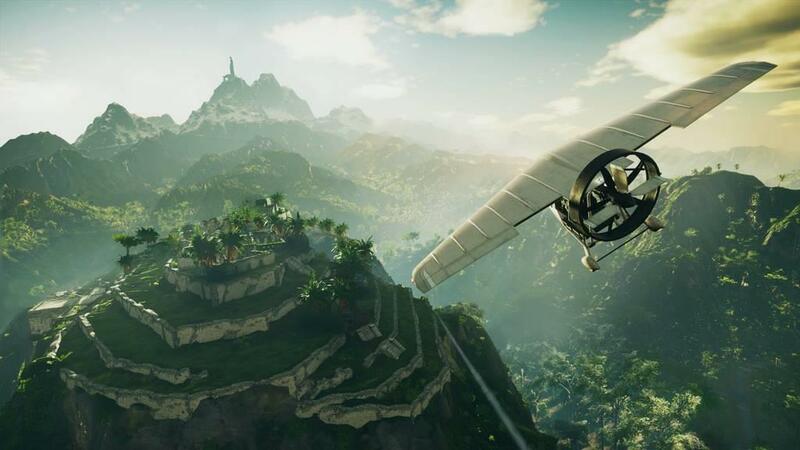 The real shine of the game comes from just whipping about the game world transitioning between grappling, wing suiting, parachuting, carjacking, plane-jacking, and inviting the player to turn the entire island into their own X-games playground on steroids.